Accommodation Zanka Sport and Event Center. Imagine a sea where the horizon doesn’t fade into the infinite distance, where the sunset paints a glowing golden bridge onto the water. Balaton, Central Europe’s largest lake, is exactly that. Each season the Hungarian Sea – as we Hungarians like to call it – shows a different face. The volcanic mountains rising high above the silky water, the vine-covered slopes spattered with white press-houses and the Mediterranean atmosphere of the Káli Basin are among the most beautiful regions in the country. Hungary’s thousand-year history comes to life in the castles and palaces of the Balaton region and its thermal baths provide physical and spiritual rejuvenation. Family wineries lure visitors for afternoons of cheerful wine drinking and the summer festivals offer unbridled partying. Outdoor activities require nothing but a bit of persistence if you’re going cycling, a bit of courage in the adventure parks or a bit of passion aboard a sailing boat. Lake Balaton stretches across 77 kilometres in the western part of Hungary, and visitors coming from Budapest, can be at the water’s edge in less than an hour and a half using the M7 motorway. However, beachside fun is not the only thing Balaton has to offer. Balaton is the ideal destination for a summer vacation. The lake’s silky water – whose temperature can rise as high as above 26 °C in the summer – can be enjoyed at more than 70 lakeside beaches, all of which have been renovated for the 2018 season. On the north side, the water deepens steeply, but the south side has shallower shores, ideal for splashing around with smaller children. Sand castles, pedalos, the slides of inflatable water adventure parks built on the lake, colourful playgrounds, beach volleyball and beach football ensure that no member of the family is bored even for a minute. In addition, the lake also offers waterskiing, kitesurfing, paddleboarding and even dragon boating, but if you’re looking for even more water fun, visit the Balatonfüred aquapark, where the giant slides will surely get your adrenaline flowing. If the weather isn’t kind to you, test your limits and conquer your fears at one of the many adventure parks around the lake, offering ropes courses of varying difficulties for young and old, while the bobsled tracks of Balatonboglár and Balatonfűzfő offer fun and speed all year round. 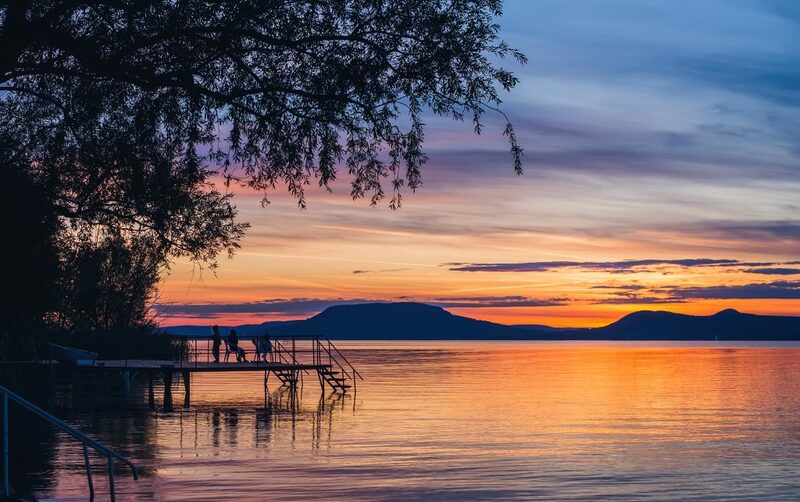 The world has innumerable hot water springs and Hungary is one of the countries with the largest thermal water reserves, but none compare to Lake Hévíz at the western tip of Lake Balaton. Covered in waterlilies, the 4.4-ha (11-acre) lake is welcoming all year round: the water temperature does not drop below 24 °C even in winter. The mineral-rich thermal waters, and the traditional treatments using the medicinal mud that covers the lakebed several metres thick, are primarily suited to treating musculoskeletal and rheumatic problems, but the mud’s beautifying effects are not to be dismissed either: just one mudpack and your skin will be rejuvenated. The hotels of Hévíz offer both traditional treatments and modern medical wellness services, supporting spiritual and physical regeneration, along with innumerable health-promotion, fitness and selfness programmes at their own spa facilities. There are direct flights to Hévíz to and from several German cities. Five historical sites you simply must visit! Listen to an organ concert in the church of the thousand-year-old Benedictine Abbey of Tihany, which houses the first extant record of Hungary, and hear the Tihany echo bouncing back from the church wall. Visit the baroque Festetics Palace in Keszthely, one of Hungary’s most beautiful landmarks. In addition to the halls presenting the aristocratic lifestyle of the 18th and 19th centuries and the historical coach collection, you can also admire the Palm House filled with exotic plants in the English garden, while the modern museum building has one of Europe’s largest historical model railways on display and in operation. Take a walk in Balatonfüred’s reform-era district, a vibrant intellectual hub of 19th century cultural life in Hungary. Try the carbonated – or “sour” – water of the free drinking well or sip on a glass of aromatic Balaton wine at the port under the hundred-year-old plane trees lining the Tagore Promenade – both will do you a world of good. Climb up to the picturesque castle of Szigliget built seven centuries ago, and you will be rewarded with what some say is the most beautiful view of the Balaton. Explore the old cobblestone streets of Veszprém’s Castle Hill, where practically all the buildings are historical landmarks. Pay your respects to the relics of the Bavarian duchess Gisela, first Queen of Hungary, at St Michael’s Cathedral. Vespa riders of the world will convene in Hungary between 6–9 June 2019. Vespa enthusiasts are to meet in the former Eastern bloc for the first time. Download the poster 2019. Jan 17. Participation pass 2018. Jan 15. Vespa World Days 2019 2018. Jun 06.